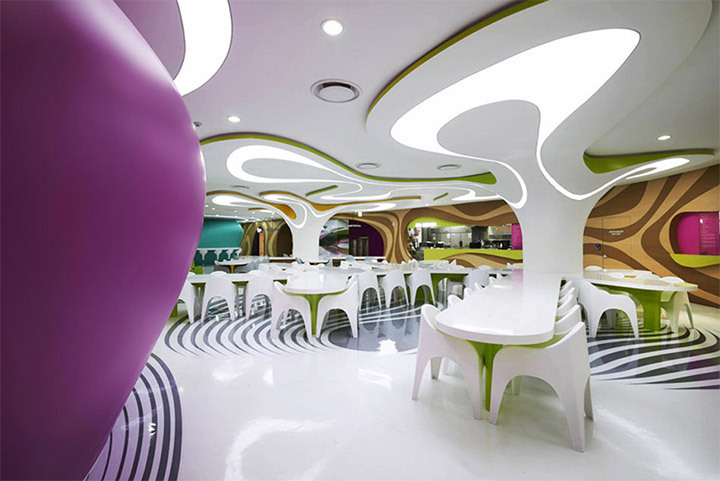 The interior design of a food court in Seoul, South Korea has received the stamp of Karim Rashid, the New York-based designer with a penchant for color and bold designs. 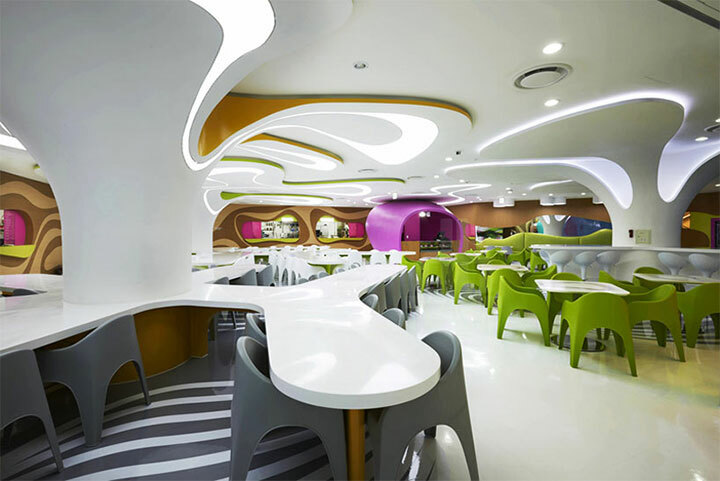 Under his magic wand, Amoje Food Capital, a cafeteria for the Lotte Department Store, has turned into a buoyant display of color and creativity. 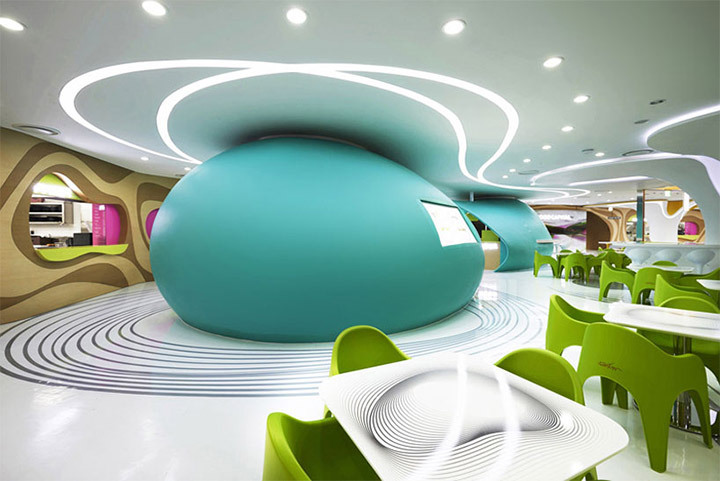 Two elements stand out right away in the design of this space: colors and curves. 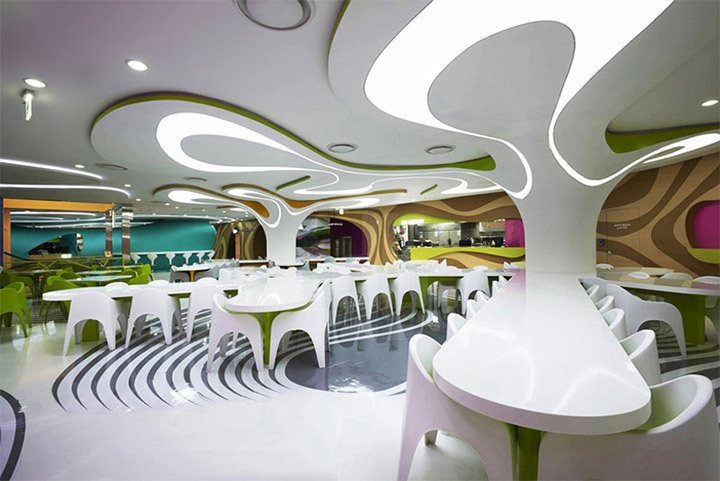 This is not the typical food court where function suffocates aesthetics. Even before tasting any food, the visitor’s appetite for visual challenge is abundantly satisfied. There is a continuity in the overall design, with tables and ceiling structures growing from the vertical pillars. 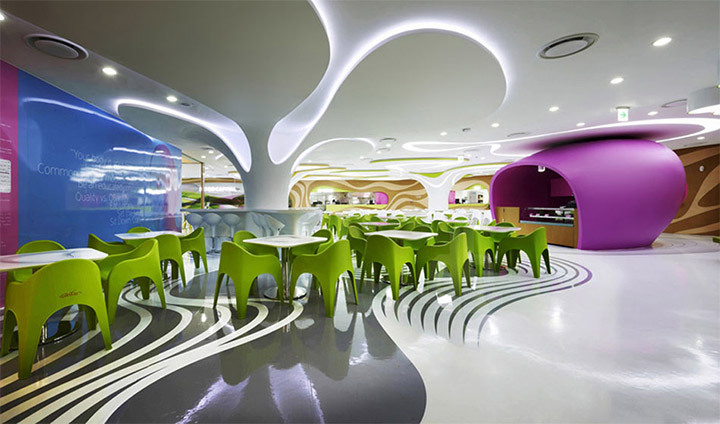 While other interiors try to achieve a cohesive design by repeating colors or materials throughout the store or by keeping up with a theme, this interior does it by allowing the design to “grow” from itself, like a multifaceted organism. This organic, natural feel is emphasized by the extensive use of curves and the almost total elimination of straight lines. However, any asperities in these lines are removed, which leads to an almost futuristic-looking interior. Wood accents are used around the perimeter of the cafeteria and take the interior back to nature. It is an intriguing and attractive combination of natural and modern elements that appeals to the complicated tastes of today’s consumer. The natural suggestions are everywhere, from the shape of the pillars, reminiscent of tree trunks, to the floor patterns that call to mind the soft ripples on the surface of water. 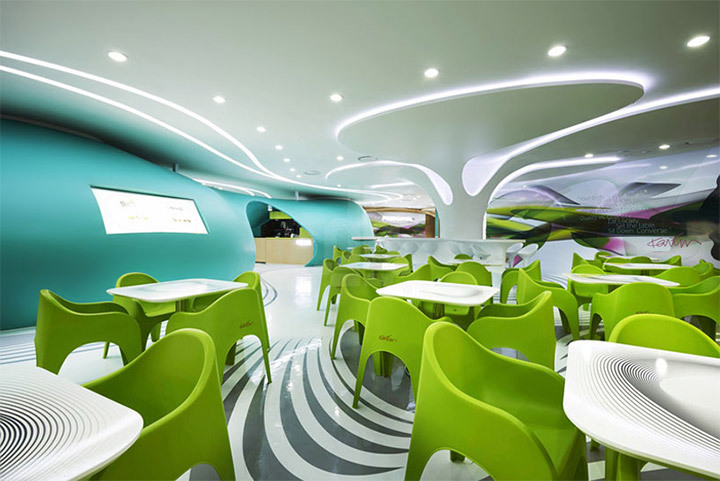 Functional areas are defined by color and by floor design. A few counters nested underneath curved, protective structures indicate the locations of cash registers. There is nothing in this design that looks like an afterthought. All the elements are integrated within the main structures, from screens and snack stations positioned around the perimeter of the lounge to the built-in ceiling lights. The floor patterns are echoed in the table top designs, and the curves of the furniture, with the comfortably enveloping backrests, are just a continuation of the same general motif. This is an excellent way to give life to an interior, by making every little detail an organic part of the overall design.